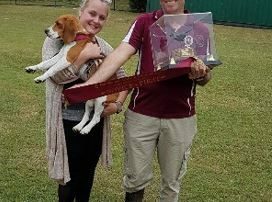 Each year the Beagle Club of Queensland holds three lure coursing events specifically for Beagles. These days allow our Beagles to get out and have the time of their lives chasing the lure and having a great time. Our lure coursing day on Sunday the 1st of July, saw our second event for this year. 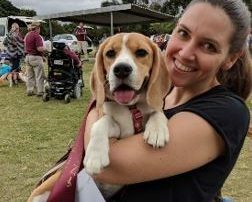 We had 54 Beagles entered to compete and enjoy the sport, and a few puppies came along to join in the fun. 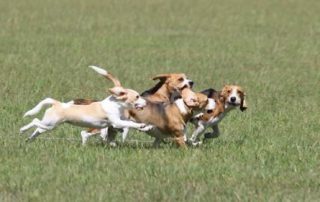 For those that have never tried the sport of lure coursing, it is a fabulous sport for Beagles and all dogs. The sport consists of the dogs chasing an artificial lure (typically a couple of plastic bags) around a coursing, while the lure is dragged by a mechanical device. For our days, the lure is controlled by a modified motorbike with a pulley system at the rear to move and control the lure. 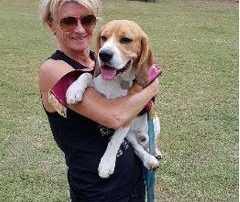 While is has a serious side to it, where the Beagles are scored out of 100 for each run they have, the main purpose of the day is for the Beagles to enjoy themselves, being free, running and having great fun. Each Beagle has two runs on the day, with the runs for this day being 300 metres in length. The Beagles are scored on their enthusiasm to chase, their skill in following and chasing the lure, their speed, agility in cornering and maneuvering, and their endurance. The highlight for our Beagle days is always the pack runs. This time we did a puppy pack run for the younger Beagles, with a small pack of 2 puppies coming out to have fun. Then it was the adults turn. As we had too many for one pack, we decided to split the pack into two. This is when the noise is at its peak and the Beagles are at their happiest. It is also when the Beagle can get out and do what they were bred to do – run in a pack. Thanks very much to everyone who helped to organise the day, who worked at the many positions that are needed to run a day such as this, for those who worked on our stalls, helped cook the BBQ and for assisting with the packing up at the end. 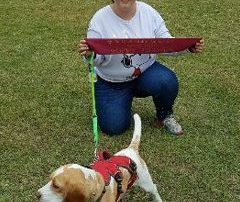 Thanks very much to Jenny Gray, who judged the Beagles, and to everyone who helped out in any way to make the day so successful. Thank you also to Crazy 4 Coffee for the hot beverages. If you are interested in coming along to a lure coursing day, or finding out more about lure coursing, visit the Queensland Lure Coursing Association Inc. web site at http://www.qldlurecoursing.com. Contact Jeff at president@beagleclubqld.org for further information. Use of information from this web site is the responsibility of the individual. 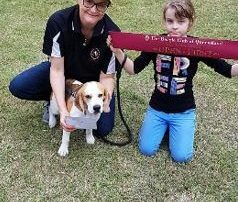 The Beagle Club of Queensland Inc. does not make representations or guarantee of the accuracy or completeness of content on this web site, including veterinary information, dog training, or behavioural advice, nor does it accept any liability for damages arising from the use of information provided.